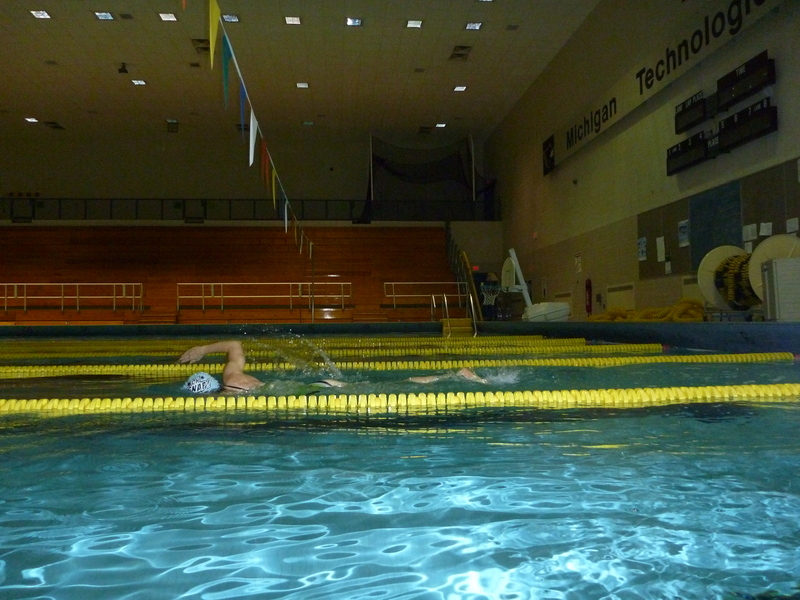 I knew going into triathlon that, of the three sports, the swim would be my weakest link. And I knew, after training in 2009 for my first Ironman, that I’d have some ground to make up on the bike and run because I wasn’t about to get out of the water first unless the race directors gave me a thirty-minute head start. Granted, I didn’t spend that much time focusing on my swim last year. 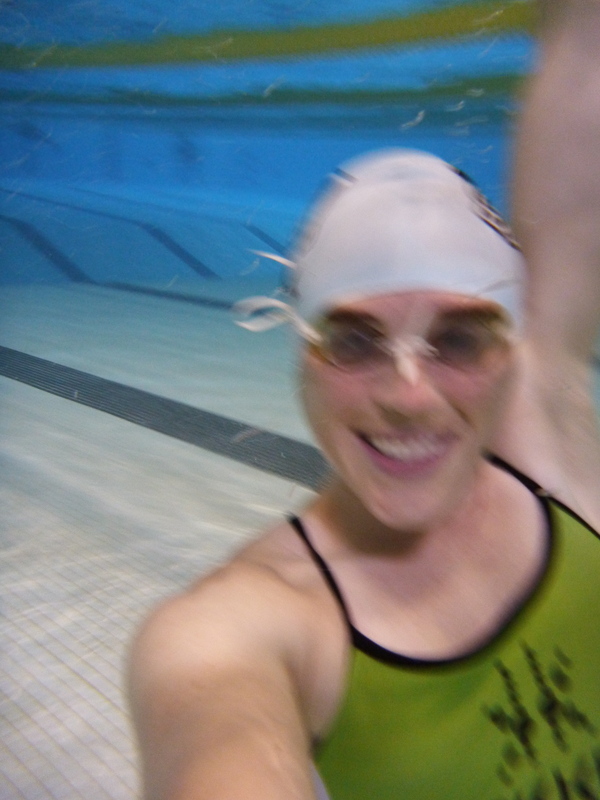 I swam in training to survive the 2.4 miles. 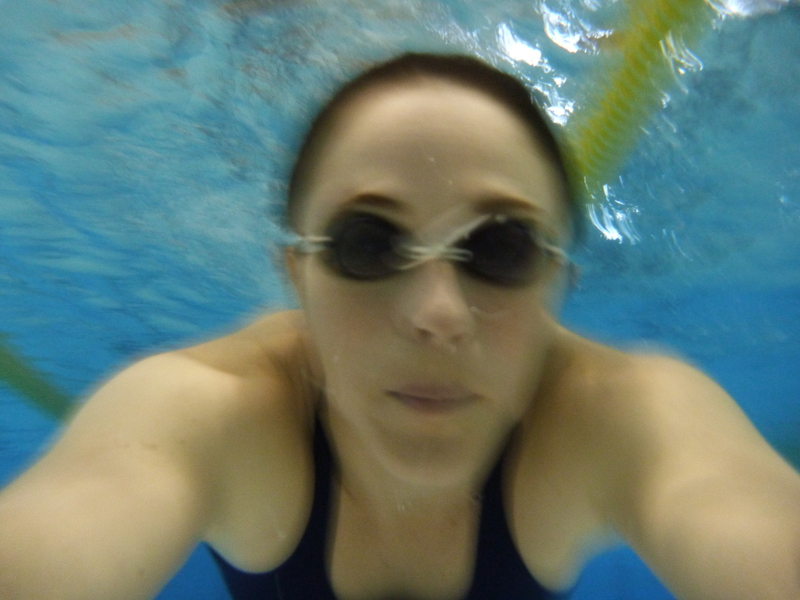 I focused more on swimming when getting bashed in the ribs than swimming fast. But I did learn a few things from just the few triathlons I have done thus far – to find feet, to find rhythm, and to put yer head down and go. This year, I decided to focus more on my swim, and by that I meant: Get in the pool at least twice a week. Don’t be a Nancy. But then I started thinking to myself, maybe twice a week isn’t enough. I want to be faster, stronger, better this year. One component of that is to be a faster, stronger, better swimmer. I know (from experience) that the only way to get faster at swimming is to swim more (than once in a blue moon). I know that I can survive the 2.4miles, so why not try to get fast at it (or fast, in a relative sense of the word)? Since there aren’t many times that I’ll get a chance to swim 1.2miles this season, it is going to be hard to chip away at a time, but I’m shooting for around 30minutes. My best is 33:31, so I think knocking off three and a half minutes won’t be too impossible, considering my training history for swimming. However, I have a feeling it is going to be tough to do. So, today was one-step-closer to reaching my goals, but the ladder is still very long and very tall. I did a decent set around 4500yds, spent over an hour and a half in the brominated waters, and didn’t feel discouraged once. I jumped in around 6:40am to the only empty lane and got to work, occasionally taking sips off my bottle of EFS (definitely one of those people that has to drink something non-chlorinated during swim workouts). After a while, I was one of two people left in the pool. It felt good to have got so much in without feeling bored or tired, but toward the end of the cooldown my calf hinted at a cramp. Good thing it was time to get outta the pool and get to my real job! I think, for my entire life, I have always had a good time swimming, I just … forgot how to have fun. Swimming became a chore last year, the least favorite of the three sports for me. I dreaded going, I’d call workouts before I got to 2000yds, and I was just plain sissy. I don’t know why, but somehow I now feel stronger and faster in the water. Maybe its my flashy new swimsuits? Less stress at work? More comfort in knowing that I can accomplish big things? Even if I’m not faster/more comfortable, I feel like I am, and maybe that’s why I am enjoying it more. I know that swimming doesn’t have to be a chore, it doesn’t have to be something that I “have” to do, and I am starting to enjoy it. Finally! OH! And I almost forgot: I wanted to add some tips I learned way-back-in-the-day when I swam in middle school and things I’ve picked up over the last year. Take a shower with your suit on! Not because you should be embarrassed to be naked, but because it is good for the life of the suit. 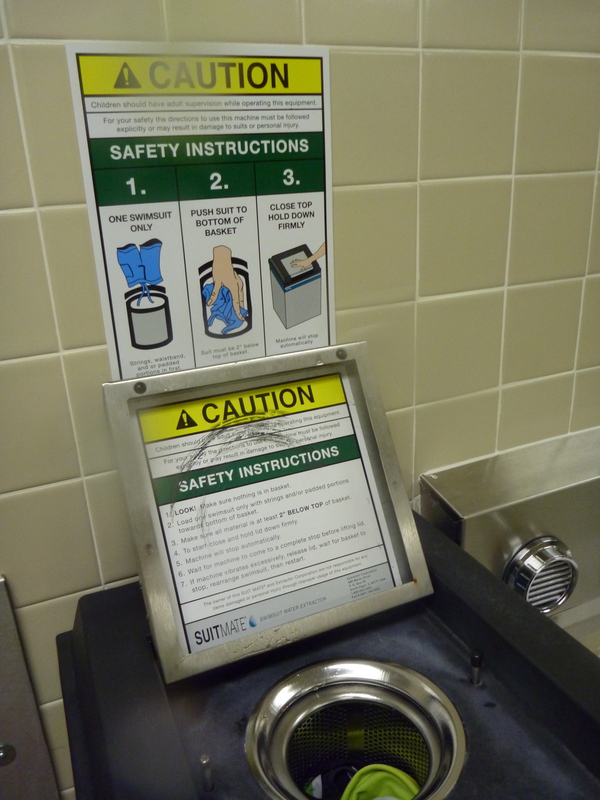 You want to get the bromine out of the suit as much as you can so that the suit doesn’t dry-rot in your locker. It happens. Just delay it! Luckily, I’m not blonde, so I never had to deal with green-hair. But, I used to get terribly bad split ends and dry, crackly hair from swimming every day. I think back then, I just went through a bottle of conditioner a week or something ridiculous (or maybe I used those hair conditioning treatments that smell like perm? I don’t remember). Now, I have Tri-Swim, and it is awesome. My comb actually runs through my hair after a shower, even if I don’t use the conditioner, and my skin isn’t flaky and dry. And I smell like I am in the tropics. It’s so nice (and it’s so almost gone). The spinner in our pool is called a SuitMate, and it is routine for me to shower, spin, and then get dressed. Hang dry the suit by both ends or lay it flat! I might be paranoid because my last suit stretched apart incredibly prematurely. Either that, or the mixture of bromine in the pool is off. Whatever the case, I learned that my suit can become too big for me, especially in the straps. I only have a locker, though, and I’m not about to leave my suit out for someone else to snag. My trick? I hang my suit by the straps, as well as the crotch. 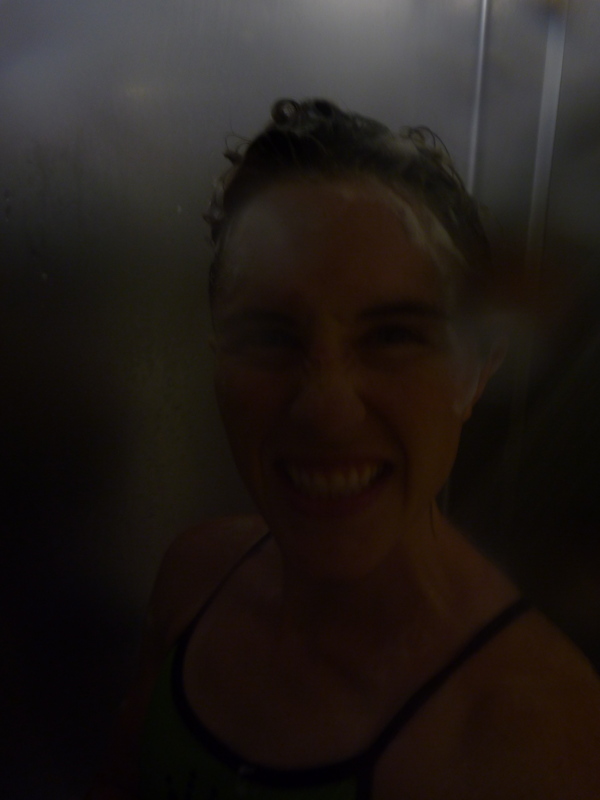 That way, the weight of the damp suit (it shouldn’t be dripping wet because of the SuitMate) isn’t pulling on just the thin spaghetti straps, and I don’t have to worry about the suit showing my non-existant cleavage during a future swim. Another trick is to put a bar across the inside of the locker and drape the suit over it, but I haven’t got around to getting a bar yet! I also want to say, I loooove Splish suits. My Trakkers suits are the first I’ve had of Splish, and they are not quite like the Speedos I’ve used in the past. They are snug but not restricting, and they are super comfy. I don’t feel like I have to pick a wedgie all the time, or pull the suit up on my chest, or adjust a dang thing. They just fit, and fit right. The fabric is different than a Speedo (my Splish suit seems more wicking/water resistant than any Speedo I’ve had), and its double-lined around the entire suit. Plus, the company designs suits for whatever the customer wants. If I wanted to make a suit that said “I am a badass”- they would print it for me with cool lettering and any strange icon I want. Amanda Lovato has some kookie ones with unicorns and rainbows, and I’m tempted to shop around for some brightly colored and outrageous ones next time I need a new one. So, extra cudos to Splish for designing such a great suit! I must be cautious in my choice of words. You see, in the UP, spring doesn’t come just once a year. Oh, no. Typically, spring comes, and we get all excited because we can bike outside, run on roads without Yaktraks, and even (dare I say it?) sunbathe on our back porches. And then we get a mid-April blizzard that layers a few feet of snow on the ground. But never you mind. Spring is one of my four favorite times of year! Ok, maybe five. Today I celebrated Spring #1 with a two-hour ride on 203. Nothing puts a winter’s worth of training on an indoor trainer into perspective than actually climbing 700ft elevation gain in about six miles. Anyway, I am getting ahead of myself. I haven’t had the opportunity to take my Jamis Xenith Race road bike out on the roads yet, and the trainer just doesn’t do it the justice it deserves. The bike is fast. Responsive. It transfers power so efficiently. I felt like I was floating over bumps in the road. And it is even a little twitchy (ok, its a lot twitchy, but that’s good, it’s a race bike!). I even careened down the hill going practically an order of magnitude faster, and I actually felt in control (sort of). I wore my Icebreaker GT 260 Rapid Leggings (merino wool), and a moderately-thick pair of Icebreaker Hike Mid-Crew socks (merino wool). My feet didn’t get cold, even without shoe covers, and my legs felt great with a single layer of clothing (and my knees were happy). The leggings are not cumbersome at all, and they are actually more like running tights than pants. Even still, I felt warm and toasty even on the descents. Three long sleeve tops, including my Icebreaker GT long-sleeve Chase Zip, a Mountain Hardwear Transition (windbreaker-type shirt), and my Honey Stinger jersey kept my temperature cool, even in the wind (and boy, was it windy). 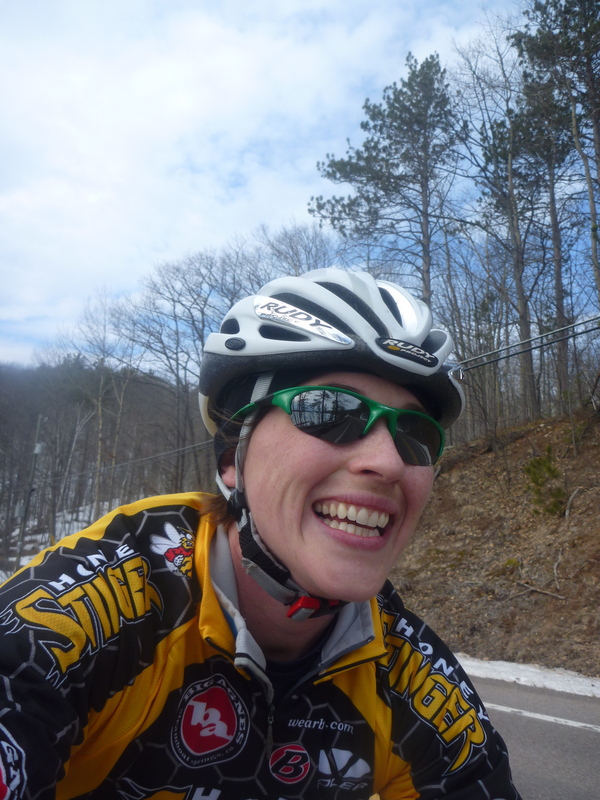 I also got to test out my new shades on the bike (note the Trakkers green). They are actually called “team green” and they are custom made sunglasses (the HalfJackets by Oakley). I like ’em. They stay put on my face, keep me from squinting outta control, and I barely feel them. Luckily, my buddy Erik has been out on the roads and he knew how clear 203 would be. It was perfect. There was very little gravel, and the traffic was minimal. It was fun riding past snowbanks, although it may have been better earlier this week when the snowbanks were a few feet taller. I guess that is what 50F weather will do. Before the ride, Erik and I met up at the pool for a little swim swam swum. I wasn’t too motivated, so I did a few 100s and dinked around with my video camera. Note to self: don’t forget your swim cap in your locker next time. I could have easily got out of the pool to grab it, but its always that much colder walking into the locker room, and I would have probably not returned. Speaking of swimming- My personal version of Swim Week is coming up in T-minus ten days. Hold on to your goggle straps as I attempt something I am not really looking forward to trying. Along with biking and running, Erik and I (along with Marg) have been hammering out hill repeats once a week up Ingot in Hancock. Our stretch is nearly a mile exactly, and it is quite a humbling feat. Nothing screams “Do more hills” than actually running up more hills. And to think, I used to be fast up them. I need to focus on attacking the hills, cuz that’s the way I was raised. So I leave you with a tired sack of sitbones, and the knowledge that my bike is back on its rack (my trainer, of course). The forecast for the rest of the week here in Houghton calls for 40F and rain, rain, rain. Goodbye snow. For now. Ever since I started training for triathlon, my time in the pool has been cursed. Aside from my incessant hunger when I get out of the water (unless, of course, I end up drinking too much water to have room for food), I get these debilitating calf cramps that literally make me stop in my tracks (or lane, I suppose). I can usually feel it coming on, after a few hundred yards (or even a few thousand), with the flip turn and the pointed toes, and it just lingers in the background. All of a sudden, BAM! It strikes. I can’t move my foot, and the cramp is so intense that my whole body freezes up. This usually occurs halfway of the length of the pool, so I look like I just give up on my set. I really want to keep going, I swear! Electrolyte imbalance: I know about hypotonic/osmolalic factors that attribute to water-getting-into-the-cells. The right amount of sodium (positively charged) and chloride (negatively charged) is what matters. There’s other aspects, too- like hypomagnesemia which interferes with the sensory nerves, and low calcium/potassium triggers. Without getting too into the nitty-gritty-sciency-ness that is proper nutritional balance (especially since I am not a nutrition expert), it’s important to keep electrolytes in check. This means not too much, but also not too little. Real quick: there are two extremes to improper hydration. The first is hyponatraemia. This means that there are not enough (“hypo” = low) nutrients (in this case, electrolytes) to water in a system. In other words, the layman’s term for hyponatraemia is overhydration. Big problems can be incured with this, including renal losses and failure. The other extreme of improper hydration is hypernatraemia. Any guesses as to what this means?… Yep! Too much (“hyper” = high) nutrients (electrolytes) to water in a system. This is typically what clinicians refer to as dehydration. Kicking too much: I try to make a good, honest effort to not kick much when I swim, especially when I am putting in big-yardage days, since it’s futile to kick much when swimming in a long-course triathlon (I want to save my legs for the bike and run). My arms are supposed to be pulling me through the water. But I know I do it! I flutter my feet too much when I swim (see the above photo of me? Where’s my left foot? That’s right, probably above the water). I might also be pointing my toes too much. Since the cramps don’t attack until I’m farther along in my swim, I have a hunch that my calf muscles might fatigue after a while and just go into a sort of seizure. Pushing off the wall too hard: I’m probably pushing off the wall with too much force, which makes me point my toes and causes my calves to go haywire. Even when I don’t push off hard, the subsequent toe-pointing might be problematic. But, I don’t know how much force to use when I push off the wall. Just a little? Not much? How do you push off if you don’t point your toes (can you even??)? Not breathing enough: I notice that when I am doing longer sets, I get really short of breath towards the end of the interval. I don’t breathe as well on the left side as I do on the right, but I am going to work on practicing alternate-breathing every third stroke to improve that. Maybe I am not getting enough oxygen and my muscles spasm because of this? Wearing fins: This is a no brainer. I know this is part of the reason I got the Charlie Horse this last weekend. Although it was my first time wearing fins in the pool, it definitely accelerated the time-to-cramping in my calf. Maybe my deal is that I don’t get in there enough, and my muscles just ain’t used to all that work. If I follow these things and I’m still not cramp-free for five straight swim sessions, I’m going to start taking my magnesium tablets. Do any of you awesome readers out there have any other suggestions that might help me fix this problem?